This Coca-Cola flavor is the first new canned Coke since 2002. But Coca-Cola hasn't launched a new canned flavor since Vanilla Coke first debuted in 2002. It was discontinued in 2005, but only for two years. It did craft limited-edition, vintage-style bottles of raspberry and peach-flavored Coke in February 2018. 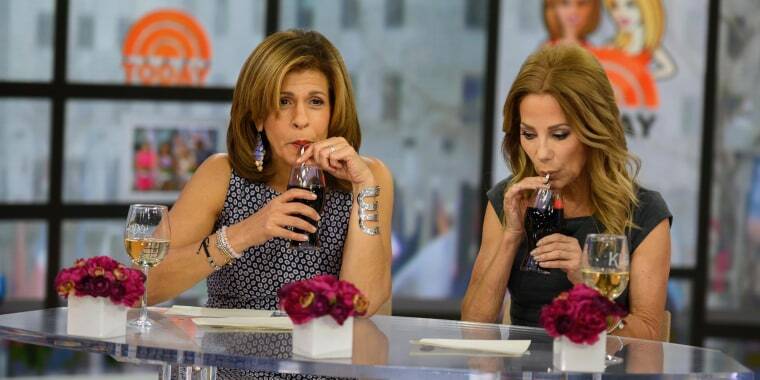 For TODAY's Tryday Friday, Hoda Kotb and Kathie Lee Gifford got an exclusive sip of the latest Coke to hit the market, but they had a hard time guessing the flavor. "Strawberry or grapes?" Hoda guessed. "I don't know." "It's not cherry," Kathie Lee said. "Cherry Coke?" Kathie Lee (who earlier mused about what happened to Vanilla Coke back in the day) and Hoda weren't sold on the Orange Vanilla drink all by itself. However, Hoda proposed that it could probably be improved with a scoop of vanilla ice cream. Anyone who's a fan of orange cream soda will get what they mean. On Twitter, the soon-to-debut soda has already caused a divide between those who've tasted it and those who haven't. One tweeter said that it "tastes like candy corn." FYI: the new orange Vanilla Coke tastes like candy corn. Another said that it's like an orange creamsicle. It's orange vanilla. They say it's like a creamcicle in taste. But some, like Hoda and Kathie Lee, weren't so sure about the flavor pairing at all. Whether you prefer to drink a simple plain Coke or enjoy a drinkable dessert, only a DIY Tryday Friday will determine Orange Vanilla's success among the diehard Coke fans.